What do you get when you cross a Yorkie and Dachshund? A Dorkie! (as it is affectionately known). The Yorkie Dachshund mix can exhibit characteristics of both breeds in terms of temperament and looks. A short-legged, elongated dog, dachshunds were originally bred to hunt badgers, rabbits, foxes and even wild boar. The word “dachshund” means badger dog in German and because of their shape and size, they are often called wiener dogs or sausage dogs. Most dachshunds are muscular and elongated with stubby, short legs. Their paws tend to be large and ideal for digging. They have good endurance and large lung capacity. The snout tends to be long. There are three types, classified by their coats: wire, long haired and short haired. There are three sizes: miniature, standard, and rabbit sized “kaninchen” in German. Dachshunds colors are varied, ranging from red, black, tan, chocolate, cream, and more. Eye color can be green, amber or light brown. Dachshunds can be stubborn, making them a challenge to train. They are playful and like to chase small animals and their toys with equal abandon. 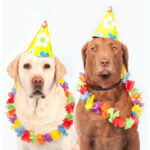 Loud barking is a characteristic and proper training is required to ensure that this doesn’t become a problem. This breed is very loyal and affectionate with their owners although they may bark or growl at strangers. The Yorkshire terrier (or Yorkie as it is nicknamed), originated in Yorkshire in northern England. Historically, terriers played a vital role in ridding homes and farms of vermin such as rats. This dog is known for its small size and tan and silky blue coat. They are winning show dogs and great companions. 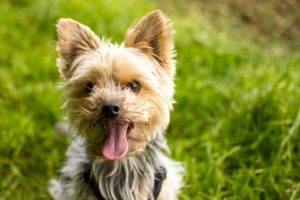 Yorkies do not shed as much as other dogs and the coats have been listed as being less allergenic than other dog breeds. Yorkies love attention and are very active dogs. They are very affectionate and loyal to their owners. A hybrid dog, such as the dorkie is the offspring of two purebred dogs, the Yorkie Dachshund mix. The coat color, features, size, eye color, and temperament may reflect the characteristics of either of the parental breeds. The dorkie may be a strong barker like the parent dachshund or display a silky coat like the terrier. Or not. 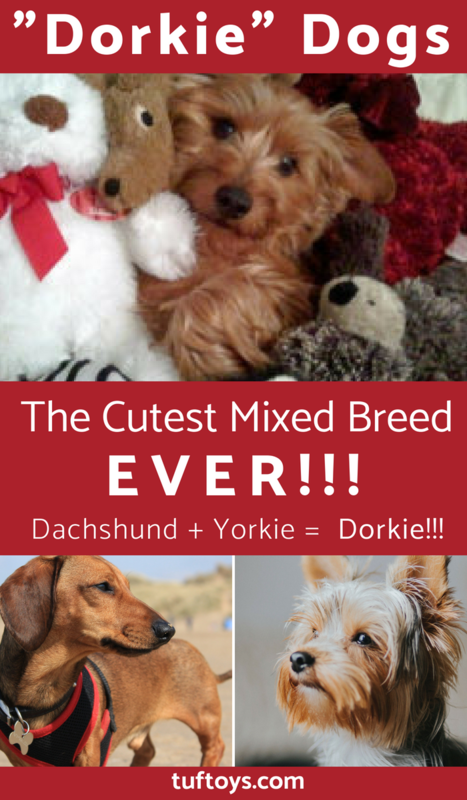 It is important to study both breeds in order to understand your Dorkie. The size of your Dorkie will vary depending on the size of the parental breeds. There are no height standards for a Dachshund. Mini dachshunds are usually under 11 pounds and standard size dachshunds are between 16 and 32 pounds. Yorkies are considered to be tall at 8 to 9 inches and tend to weigh under 7 pounds. The Yorkie Dachshund mix has become quite popular in western North America. Enjoy your Yorkie Dachshund mix. They are often very affectionate and clever dogs similar to the parental breed. Yorkie Dachshund mix dogs are undeniably cute. 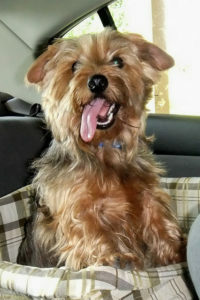 This mix of dog is affectionately known as a Dorkie. They have the physical characteristics of both the parental breeds and can have the temperaments too! Dachshunds are known to be a challenge to train and require extra time and energy to do so. Clicker dog training can be an effective method for training this type of dog. Let’s take a look at what it may take to train your Dorkie. Training your Dorkie can be difficult because of the reputation of the parents, in particular, the dachshund. They are considered to be stubborn and independent. (like a two-year-old!) They will wait you out while challenging you as they make their own mind up about what they want and how they’re going to get it. This is where being firm and committed is important. 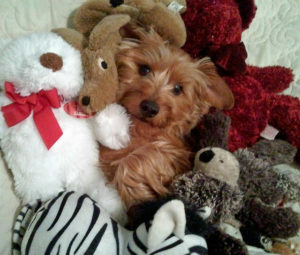 No matter how cute your Dorkie is, it will still be a dog and needs to be led by you, in the position of the alpha dog. If you start to treat your Dorkie like a person in the household or let it get away with certain actions just because of the dog’s cute small size, you certainly begin to lose the training battle. Clicker dog training can help. Dachshund Yorkie hybrids will have longer backs similar to the parent dachshund. Because of this, they may experience injuries when not properly trained to avoid jumping too much or climbing. That independent streak could cause them harm if the training isn’t sufficient to keep their actions (and attitude) in check. Your cute little yorkie dachshund hybrid needs to be exercised a lot and it is vital that you start when your Dorkie dog is young. Give your puppy as much exercise as you possibly can and keep them busy. Remember that the dachshund parental breed has considerable energy because it was bred to hunt. Dorkie training should be done in brief sessions no longer than 5 minutes or so. One wants to accomplish as much as possible before they decide they may not wish to follow along with the training. A Dorkie puppy needs to be trained in the basics like “sit”, “stay” and especially “down”. 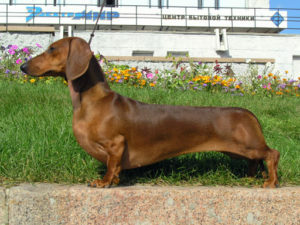 Because of the longer back, Dorkies may have limitations (similar to a dachshund) regarding how they can jump or climb. It is suggested you carry them down and upstairs and don’t let them jump up on furniture. Teach them early that these actions aren’t allowed. Dog clicker training for your Dorkie can be an especially effective approach to teaching your dog. Clicker dog training can be achieved in short bursts and fit their brief attention spans. Dorkies love attention as well as treats for good behavior. Punishing your Dorkie isn’t very effective because of their independent and stubborn nature. Excessive punishment can make your dog aggressive and thus should be avoided. Many dog owners will be wondering how they can stop dog biting. It can be very stressful determining the best approach to controlling the biting behavior. 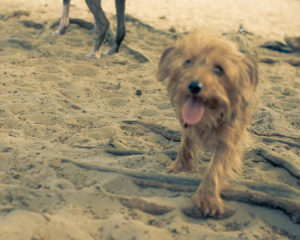 Any puppy, such as a dachshund yorkie mix, that bites is considered to have an annoying and undesirable behavior. The best time to pinpoint this behavior and to actually stop it from continually occurring is when your dachshund yorkie mix is a puppy. 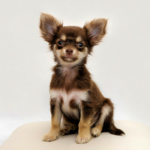 Any puppy who is under the age of six months will be much more easy to train because they are within the formative years of their development. One of the concerns is that people will often assume that puppies are simply playing and aren’t actually trying to cause any harm. What is really happening, however, is that your puppy will be learning how to properly assert its position within the pack, and will be using its teeth in order to show who is in charge. If you plan to stop your Dorkie from biting then it will certainly start at this stage. TIP #2. Act Like Mom. The maturity of your Dorkie will mimic the way in which your puppy would have been treated within the litter and with its mother. For example, Giving your dog a slight nip or pinch on the neck, or making a sound when you have been bitten, or by substituting the action with a toy instead of your hand are all excellent ways to teach your puppy how unacceptable it is to bite people. If you are having trouble stopping your puppy from nipping it is a good idea to hire a trainer or send them to an obedience school. TIP #3. Restrict Vigorous Physical Playtime. If you have allowed your puppy to continually bite and show that it is in a position of power in the household it will continue this behavior as it gets older. Several different factors can certainly contribute to this type of behavior. One suggestion is to stop playing physical games with your dog and certainly don’t include any dominance related fun with them. In addition, it is important to stop your animal from running the household. Make sure that they have specific boundaries and reduce the areas in which they can go. Crate training your Dorkie may well be necessary. A strong obedience program should prove helpful. TIP #4. Seek Professional Help. If your dog continues to get away with this undesirable behavior then it may well evolve into a more significant problem when they are a fully grown adult. They may bite you and will always think of themselves as leader of the pack. If your older Dorkie does bite it is important for you to seek professional help quickly because there may be a serious danger that the dog may choose to assert his dominance on anyone and at any time. When you are learning how to stop dog biting it is important that you start as early as you can. 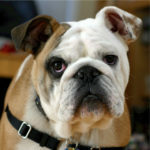 Barring mental disorder or disease, the behavior of the majority of dogs who do bite as adults could have been prevented with proper training as a puppy. If you have decided that it is time to stop dog barking in your house, then you are probably already aware that there are loads of things that you can do in order to resolve this problem. Dogs, after all, are born to bark. As such, regardless of the type of breed you have, most dogs will bark in order to voice their needs and feelings. Dachshund dogs, in particular, are known for their strong barking. There is, in fact, only one particular dog breed that doesn’t bark at all – the Basenji. Before you can stop your Dachshund Dorkie mix dog from barking, it is important for you to understand exactly why they bark and what types of barking you are going to be attempting to control. As you can see, there are myriad of reasons why a dog barks and it is certainly a large part of who they are. 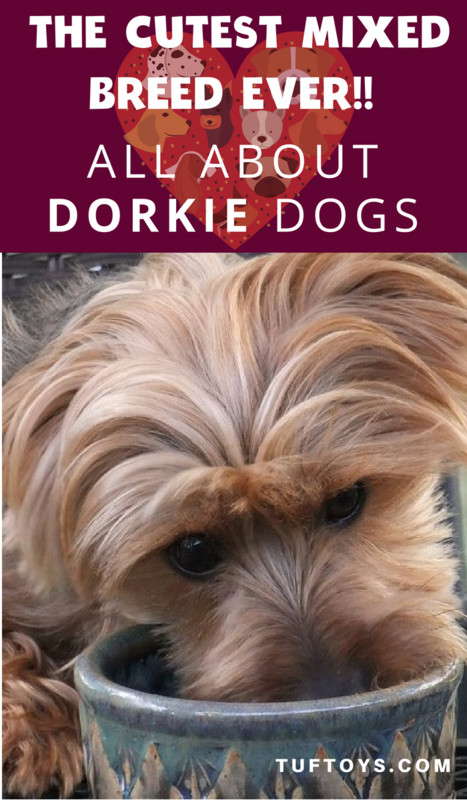 As such, it is impossible to stop your dorkie from barking completely and they are always going to want to express themselves for a number of different reasons. When your dog refuses to stop then it is imperative that you determine whether or not their barking is actually warranted. Generally, it will not be excessive and can, therefore, be controlled. If you realize that this is a situation then you should ask certain questions. What exactly is the dog barking at? If you have determined that your dorkie happens to be barking because it is being territorial and alarmed then yelling at your dog, which is never effective at the best of times, won’t stop dog barking. Negative reinforcement can lead to biting or other forms of aggression. Your dog will not exactly understand what you are trying to say and therefore they will stop barking but the territorial issues are likely to remain. Instead, it is important to you to create a specific situation in which your dog won’t actually feel a territorial urge to defend itself. This will be the start of a process to regain control of the household. Make sure that you are the leader of the pack and always show that you are the one in charge. You will be in the alpha dog leadership role. In addition, you will wish to reduce your dog’s ability to recognize threats to its territory. For example, draw the curtains so that the mailman cannot be seen, get a fence so that they can’t see beyond the yard, and make sure that they don’t have any access to your windows. Dogs often have anxiety issues and as a result, barking is likely to become a symptom of this. They will often want to reach out to you and will therefore constantly be barking to you to come back. Often, this is because you may well have rewarded this specific behavior sometime in the past. When you get home and they are excited, you will probably have given them some immediate attention. Instead of rewarding them, however, you will want to ignore them for roughly 10 or 15 minutes so that they don’t associate your return with attention. Last of all, if you want to quiet the household and stop dogs barking then you need to teach your pet how to speak and how to be quiet. Create a command that will allow a greater degree of control over their behavior and your pet will begin to control their barking when it is necessary. A great benefit of this is that you will still be alerted to any intruder. Your barking dog, therefore, doesn’t have to be the nuisance of the community that it may have become. If you learn to control it early then you shouldn’t have to be concerned about neighbors coming to your door every single day complaining about your Dorkie barking.